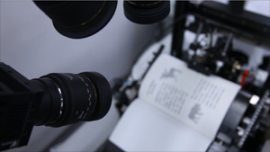 BFS-Auto can achieve high-speed and high-definition book digitization at over 250 pages/min using the original media format. 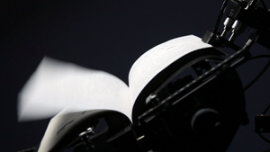 This performance is realized by three key points: high-speed fully-automated page flipping, real-time 3D recognition of the flipped pages, and high-accuracy restoration to a flat document image. 1. High-speed page flipping machine at 250 pages/min The automated flipping machine can provide high-speed and labor-saving style of book digitization. The key point is to design the mechanism not to cause obstruction for the scanner while maintaining full speed. 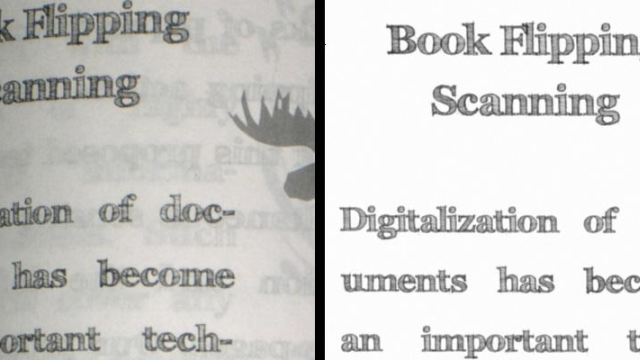 The developed system can flip and scan the book at over 250 pages/min without modifying the book by cutting. Therefore, we can finish a book (250 page) within a minute. 2. High-speed & high-definition book digitization based on real-time 3D recognition Our system continuously observes 3D deformation of the each flipped page at 500 times per second, and recognizes the best moment for book image digitization at the highest quality using the newly constructed original algorithm in real-time. At this recognized moment, the high-definition camera captures the document so that both high-speed and high-definition performance all is realized. The definition performance is enhanced to 400 pixels per inch. 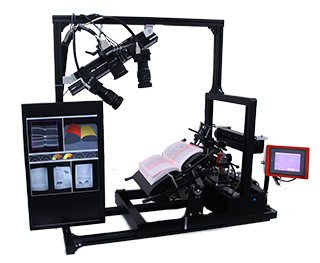 This technology enables high-speed and high-definition digitization with the speed of the developed flipping machine without missing any pages. 3. Real-time 3D restoration to a flat document image This system has a technology to restore a captured image which is distorted because of page curling to a flat original document image by using the captured image and the obtained 3D deformation. This system’s new improvement to processing speed allows real-time restoration for capturing books. In the diagram at the left, before and after images show the restoration process. If you want to use the original video, please send an e-mail for copyright permission to www-admin@k2.t.u-tokyo.ac.jp .